Local is good and provenance is key. This is what we stand by when choosing which producers and makers we want to work with at the Farm Shop. We begin on the Estate itself and work from there, sourcing from within a 30 mile radius wherever possible, from established, often family run businesses who really know what they are doing. Here are some of the fine people we work with. We've been working with free range farm Nant Ucha in Wrexham for over 10 years now, and such is their quality, we have customers who come to the Farm Shop specifically for Nant Ucha. Local, fresh and free range, and as Nant Ucha say 'Mother Nature's Greatest Fast Food'. 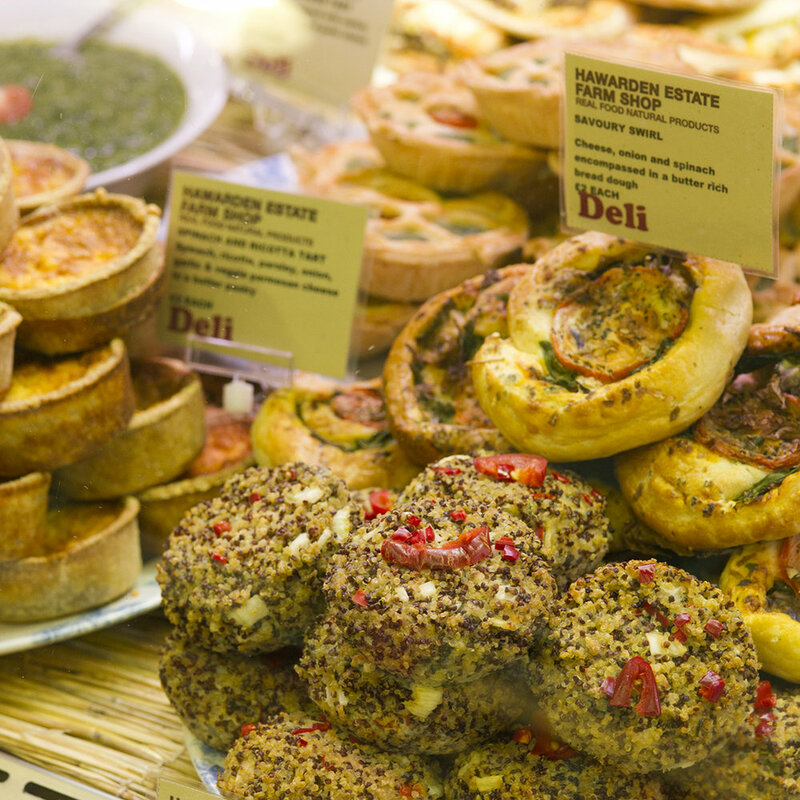 Veggie Fayre creates delicious artisan Vegetarian and Vegan foods from scratch using the very best fresh ingredients. We have been working with Sue for a number of years now, and her pies and tarts are incredibly popular with our Farm Shop regulars. Lee Hollywood is just as devoted to creating perfect loaves as his superstar brother Paul. Lee spent his childhood watching and learning his craft from their father, who had a string of bakery shops across the country. It’s in our blood; Lee's father was a baker, his uncle was a baker, and he spent every weekend with his dad in one bakery shop or another. Dave Connor is a tennant farmer on the Estate and supplier of some of our top quality beef here in the butchery. Our butchers have the luxury of hand selecting in person the heifers of their choice from the herd. The award-winning Pudding Compartment was founded in 2007 by husband and wife team Steve and Juliet West. We have been serving their premium cakes and desserts i our Cafe and Food Hall for a number of years, and think they can't be beaten on taste. The bara brith is our top tip! Alan Huson grows produce on Hawarden Estate land less than 500m from the Farm Shop. We speak to Alan on an almost daily basis, to find out what what he has, so we always have a great supply of freshest possible seasonal produce. Fruit and vegetables are picked in the morning and brought straight to the shop, with less than one food mile incurred, not bad. The Bourne family has been hand-making fine Cheshire cheese since 1750, and since 1930 at the Bank Farm. They still use traditional 'hands on' techniques to produce cheeses which have been awarded gold, silver and bronze medals at the British Cheese Awards, prizes at the Nantwich International Cheese Show and Gold and Silver Medals at the World Cheese Awards. We chose to collaborate with Cheshire Chutney on our Farm Shop range of Provision Merchant because they are local experts in hand making jams, chutneys and drizzles. They only use the very best ingredients and old family recipes. Nick works with the local community, commercial growers and wholesalers to have the pick of the local crop often making the jam the same day the berries are picked so consumers can be assured of full product traceability. Suppliers of our Farm Shop free range pork and poultry, Robert and Alec Mercer are fourth generation farmers. Their family have farmed in the heart of rural Staffordshire since 1930. Together, they have a lifetime of working knowledge, passed down from their father, grandfather and great-grandfather. It’s this familiarity with the land, that’s helped the Mercers develop their traditional free range approach to rearing animals, and passion to provide low-density, environmentally sound and welfare-oriented farms. Two words: Black Bomber. It's one of our all time favourite cheeses. Ever. The Snowdonia Cheese Company began its journey selling cheese at UK farmers markets and the response was immediately astounding. Within months the cheese had made its way into fine-food delicatessens and luxury grocers up and down the country. We are proud to stock a wide range of these fine Snowdonia cheeses at the Farm Shop. Purple Moose Brewery is a '40-Barrel' micro-brewery based in the historic harbour town of Porthmadog, North Wales, close to the mountains of Snowdonia. They currently produce five cask conditioned beers and three keg beers. All of these are also available in bottles and are available at the Farm Shop. Bellis Farm supply all our milk at the Farm Shop. Bellis has a long history with the Hawarden Estate and the cows graze on Estate Land. Our milk could not get more local. We're happy to admit that we're coffee snobs, and that's why we work with Allpress Espresso; because we think they're the best. Allpress is a small company that was founded in New Zealand in 1986 and is widely regarded as one of the finest small batch producers anywhere in the world. Our baristas have been highly trained by Allpress’s London team to make the perfect coffee, and our Cafe + General Store is fast earning a reputation for the best coffee around in Broughton. Founded in 1982 Patchwork is now a local, national and internationally recognised and award winning producer of pâtés, tarts, pies and ice-creams. Yet everything is still hand-made in small batches, without artificial colouring, additives or preservatives, to Margaret's original recipes. Their most famous and popular product is its award-winning pâté. From chicken liver to game liver to vegetarian - each pâté is made using locally sourced produce and tastes sensational. Wild Horse Brewing is a small craft brewery in the seaside town of Llandudno. Established in 2015, their aim is to brew the best beer possible, using the best ingredients they can source and treating them with respect, experimenting with new techniques, and doing everything they can to produce consistently good beer. Nom Nom is proper Welsh chocolate. Its cocoa is always sourced from a single region that naturally gives it a beautifully unique character. Nom Nom pride themselves on working with proper lcoal food producers and showing their wonderful produce in their bars. Flavour is king, Nom Nom promises to always make chocolate that packs real flavour from real ingredients, fresh in their kitchen. We think it's the best chocolate around. We combed Wales to find the very best turkeys. We chose Usk Vale Farm in the rolling hills of Monmouthshire for the quality and sustainability that the family run business stands for. The turkeys are fed only with the best feed produced here in Great Britain and Usk Vale Farm consistently produces award winning birds. We believe that they are the best turkeys around. The Black Mountains Smokery have been supplying their award-winning smoked foods and gourmet hampers from the heart of the Brecon Beacons for over 20 years now, and we are excited to be stocking their traditional smoked salmon, haddock and mackerel here at the Farm Shop, all cured and smoked in the footsteps of the traditional craft using the skills of the finest smokers. Ammanford is a small town of 5400 people. A former mining community where anthracite coal (Black Gold) fuelled the local economy. Unfortunately in 2003, the last of the local collieries closed, brining with it a slow demise with high unemployment with no prospect for the school leavers of today. Coaltown Coffee's plan is to change this. to bring back an industry & get this town producing a new from of black gold. Coffee. The role of the ‘cider merchant’ was once an accustomed thing, particularly through the heyday of cider and perry in the 17th & 18th centuries. Today The Fine Cider Company supplies some of the best restaurants in London, from Lyle’s to Claridges, and now add to that list the Hawarden Estate Farm Shop, as Felix Nash and his team have taken on curating our full range of cider here at the Farm Shop. Come and see what they've chosen this month. Each jar of Calon Lân sauce, chutney or jam is made in small batches by hand in Pwllheli on the Llŷn, North Wales. Achieving homemade quality and taste is key for Calon Lân’s founder Geraint Hughes. In 2008, the small business shot to fame through Europe as being the first to plant an olive grove in the UK. Despite still waiting for its first proper harvest, Geraint says it was a good way of combining his enthusiasm for growing crops with the business of producing quality food. Having mastered the art of bread and pastries, Pump Street Bakery turned their attention to chocolate. Along with only a few other UK producers, Pump Street are making small batch, handmade chocolate from beans imported directly to them from family farms and cooperatives around the world. Upon arrival in our bakery, the team hand selects the beans and then carefully roast, winnow, grind and conch them for up to 5 days before maturing and tempering the chocolate into bars. They tailor the process at each step of the way to coax a unique flavour from our different types of beans. If you ever find yourself anywhere near Barry, get yourself to the Hang Fire Southern Kitchen, where Sam Evans and Shauna Guinn are turning out some of the best barbecue food outside the Deep South. Sam and Shauna use this rub a lot at their smokehouse, having tinkered with it almost constantly since they started Hang Fire. But they're pretty settled on this version now. Use it on ribs, pork shoulders, chicken or as a seasoning for meatballs and pretty much on almost anything. And catch Sam and Shauna at the next Good Life Experience, cooking over the campfire.